What do I do if I suspect my pet has been poisoned? If you suspect that your pet has eaten something poisonous, then phone us for advice. It may be that we will ask you to make your pet sick. The easiest way to do this is to place a large washing soda crystal on the back of his tongue. It is worth keeping washing soda in the house just in case it is needed for this. Never make your pet sick without checking with us first - with some poisons it will make matters worse. Many human medicines are poisonous to animals. 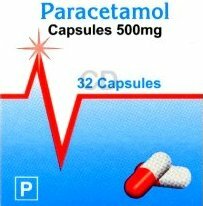 The most common ones that we see are probably human painkillers such as ibuprofen and paracetamol. Both of these can be very dangerous - as little as half a paracetamol tablet is enough to kill a cat. Some flea treatments on sale in supermarkets and pet shops contain permethrin. The commonest form of poisoning occurs when the dog form of this treatment is applied to a cat though the packaging explicitly warns against using the dog preparation on cats. Unfortunately some owners fail to read this and treat the cat regardless. Affected cats become over-excited have fits and fall into a coma. Without treatment these animals will usually die. This is probably the type of poisoning that we see most often. Metaldehyde is used in slug pellets, even so called pet friendly slug pellets contain them. Metaldehyde will cause fitting, coma and death. Whenever you treat your garden with slug bait ensure that you fence off the treated areas to prevent the pet getting access to the poison, or even better, don't use slug bait at all. 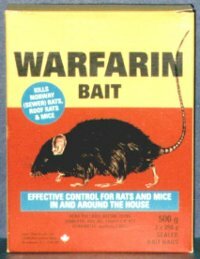 Rotenticides (rat and mouse poison) usually contain chemicals such as warfarin that stop the blood clotting. Dogs often eat the poison itself while cats often eat mice or rats that have been poisoned. If untreated the animal can bleed to death. 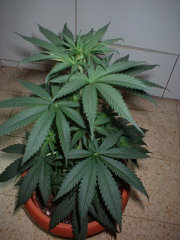 Many house and garden plants are poisonous. Common ones include dumb cane, poinsettia, laburnum, rhodedendron, daffodil and foxglove. If your pet has eaten a plant and you are not sure that it is safe, please check. This recreational drug is quite commonly ingested by pets. Although the relative quantities ingested can be quite high (no pun intended) the drug rarely causes serious side-effects. Overexcitement, drooling and increased sweating. Occasionally an affected pet will seem unaware of its surroundings and it has been reported that these pets often have an increased appetite. Fresh and dried grapes (raisins sultanas etc) are poisonous to dogs and cats. Many people give their dogs grapes as treats with no ill effects, but in larger quantities both grapes and even more commonly raisins can lead to kidney disease and kidney failure. It is still unknown what it is in grapes that causes these problems. It can be seen with any variety of grape, and is seen with home-grown grapes as well as shop-bought grapes. Chocolate contains theobromine, a stimulant related to caffeine, which can cause hyperactivity, heart arrhythmias, and sometimes coma and death. A fairly large amount of chocolate must be consumed, but given their nature dogs are happy to over-indulge. Deaths have been reported after ingestion of 115mg/kg of baking chocolate (about 3 ounces for a 7kg dog). Antifreeze contains a highly toxic compound called ethylene glycol. As little as one teaspoon can kill a cat. 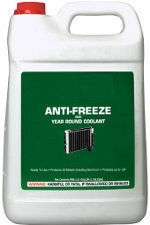 Antifreeze is especially dangerous because it is sweet and therefore attractive to animals. If ingested anti-freeze forms crystals in the kidney rapidly causing kidney failure and death. Never give your pets any medication unless you are instructed to do so by a qualified veterinary surgeon. Keep all prescription and over the counter drugs in a safe and secure place, well out of the way of children and pets. Always ensure that pesticides, rodenticides and molluscicides are stored in a safe place and always ensure that the areas where you may be using these products are inaccessible to pets. Always ensure that herbicides and fertilisers are stored in safe location and that, for an appropriate amount of time, pets have no access to areas where these products have been used. Do not use grapes, raisins or sultanas as treats, and keep them away from dogs. Always ensure that car maintenance products are stored safely and ensure that pets have no access to the car maintenance area. Beware of the plants in and around your house. Always ensure that household cleaning products are safely stored and never allow your pet access to areas where these products may be in use. Follow the manufacturer's instructions when using flea treatment available from pet shops and supermarkets, or even better, follow your vet's advice on the availability of highly effective and safe Prescription Only flea treatments.